Frecciarossa 1000 high-speed passenger train of Italy is jointly developed by Bombardier and AnsaldoBreda. The first unit of Frecciarossa 1000 was unveiled at Pistoia in March 2013. Image courtesy of E656073. With a top speed of up to 400kmph, Frecciarossa 1000 is considered to be the fastest train in Europe. Frecciarossa 1000 is designed for interoperability throughout the European high-speed network. Frecciarossa 1000, also known as V300ZEFIRO or ETR 1000, is the latest addition to Bombardier’s ZEFIRO class of high-speed trains. Designed for speeds up to 400km/h, Frecciarossa 1000 is the fastest train in Europe. It is an advanced model suitable for long-distance passenger service on high-speed lines. Interoperability, safety and comfort are among the major features of the train. "The new high-speed train made its inaugural journey from Milan to Rome on 25 April 2015." Frecciarossa 1000 trains were ordered by the Italian train operator Trenitalia. Bombardier built the train sets in Italy, in partnership with AnsaldoBreda, a subsidiary of Finmeccanica Group. Bertone is the designer of the train. The first Frecciarossa 1000 train unit was unveiled at AnsaldoBreda’s Pistoia factory in March 2013. The world premiere of the new train was hosted by Bombardier at its Vado Ligure factory in July 2013. The first unit of Frecciarossa 1000 was ready for homologation test runs on the Genoa-Savona rail line in August 2013. 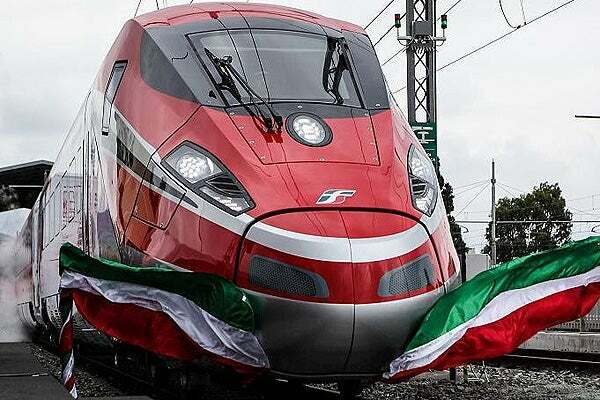 The new high-speed train made its inaugural journey from Milan to Rome on 25 April 2015. The trains are expected to start commercial service on the Italian rail network in June 2015. Bombardier and its consortium partner AnsaldoBreda were awarded a €1.54bn ($2.1bn) contract by Trenitalia in September 2010 to supply 50 Frecciarossa 1000 train units. The cost a train set is €30.8m ($40.2m). Bombardier’s share of the contract is estimated at €652m ($889m). Frecciarossa 1000 is a 200m-long bi-directional electrical multiple unit (EMU) based on Bombardier’s ZEFIRO and AnsaldoBreda’s V250 train designs. The eight-car train has a fixed formation with the traction distributed along the train. Its bogies are designed with active suspension. The train is fitted with 16 traction motors that offer a starting acceleration of 0.7m/s2. The ZEFIRO is the latest class of very high speed (VHS) trains from Bombardier. They are claimed to be the most economical and environmentally friendly trains in the world. The class was displayed at InnoTrans 2010, an international trade fair for transport technology, held in Germany. The front ends of the train feature a unique design that provides good aerodynamics in addition to safety and comfort for train drivers. The driver’s electronic compartments are designed with a modular concept to allow compatibility with railway systems of different European countries. The train is equipped with a diagnostics system that helps to better manage irregularities between the train’s actual conditions and performance. It provides information about the operation of all onboard systems, as well as that of each motor axis on a continuous basis to on-board personnel, maintenance personnel and the operations control rooms. Frecciarossa 1000 offers high-commercial speed of 360km/h, while also being a silent train that creates less noise and contains vibration created during high-speed operation. Interoperability is another notable feature of the Frecciarossa 1000 train. The rolling stock design allows operability with the different electrifications and signalling systems on the European network. The on-board signalling devices installed in the train comply with European rail traffic management system (ERTMS), which allows for integration of different national signalling systems and automatic train protection (ATP) systems in Europe. It renders interoperability on all European high-speed networks, including Italy, France, Germany, Spain, Austria, Switzerland, Holland and Belgium. Frecciarossa 1000 offers a capacity of 485 passengers in four classes, namely executive, business, premium and standard. It has tip-up seats for disabled passengers. The train has ergonomic seats with an individual light fitted for each seat. The carriages of the train feature on-board monitors and power sockets for personal computers. Restaurant and bar services are offered onboard. "Frecciarossa 1000 trains were ordered by Italian train operator Trenitalia." The executive compartment features a meeting room. It has 12 single reclining and revolving seats that enable passengers to adjust their position in accordance with the direction of train movement. The business and premium compartments feature lounges. The business compartment also has a silent area for the passengers who value tranquillity during travel. Other features of the rail cars include LED lighting, soundproofing and climate control. The train is equipped with modern Wi-Fi connectivity that gives its passengers real time access to web and multimedia technologies.